• Project: Contains a tree of the action lists, global script and variables in your project. • Actions: Lets you add new actions to your project. • Properties: Lets you edit any property of any action, as an alternative to using the properties dialog. • Run Tab: Shows progress and statistics while projects are running. This is where you create and edit the actions of your project. 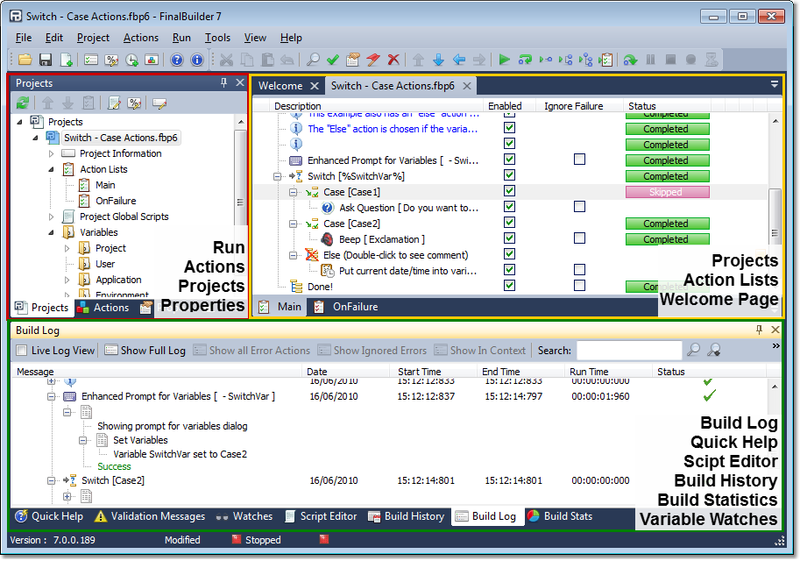 There are two built-in action lists, Main and OnFailure. You can also add extra actions lists. To add an action to an Action list, just click on the Action Type that you want to add, it will be inserted after the currently selected action in the current action list, or you can drag and drop the action on the list where you would like it. This is covered in more detail later in Working with the Action Types Panel. There are several tabs in the bottom section, but the most relevant ones during design of your project are the Script Editor and the Quick Help.